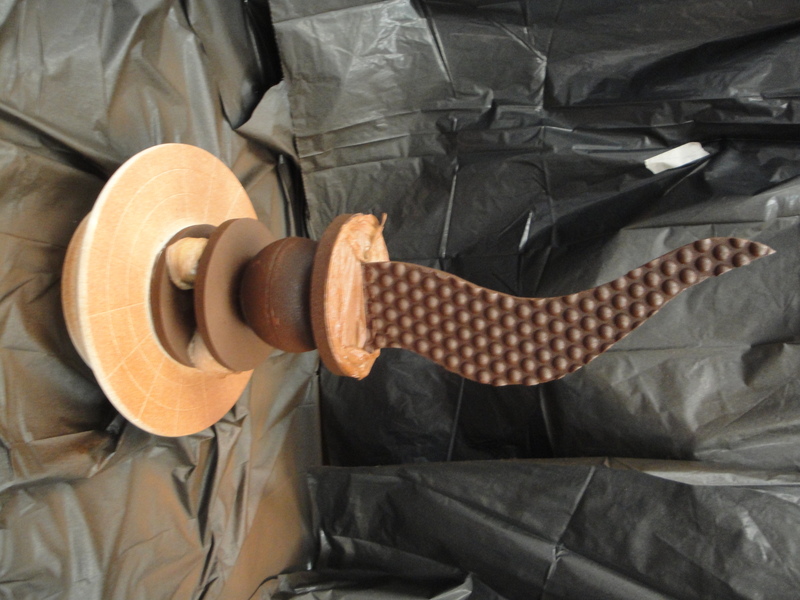 After completing our lessons on molded, filled, and dipped chocolates it was time to move onto the conclusion of our chocolate module by building out our chocolate showpieces. We were broken out into teams of two and given basic instructions on the structure that our pieces needed to have. The first class, we sat for a while and talked about all the different materials we could use in our showpiece. 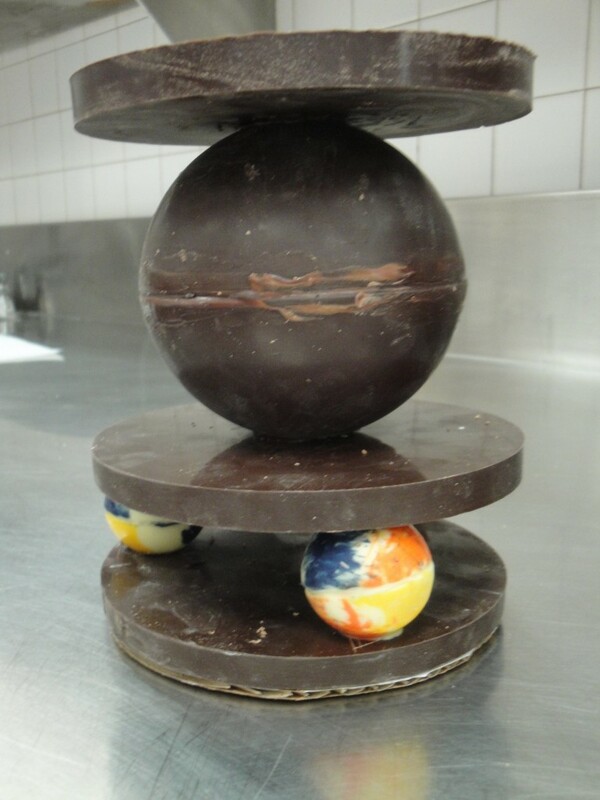 Tempered chocolate would need to be used for any structural elements because of its strength. 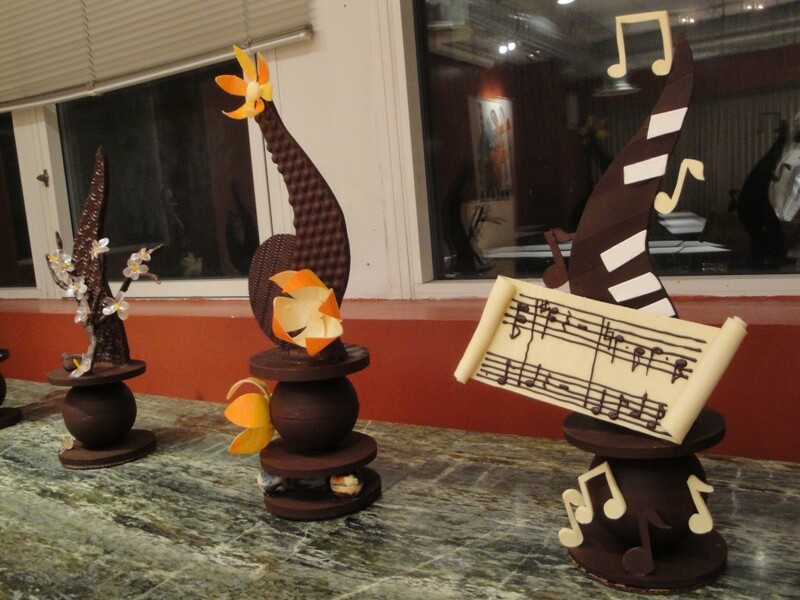 Modeling chocolate could be used for any decorative items. 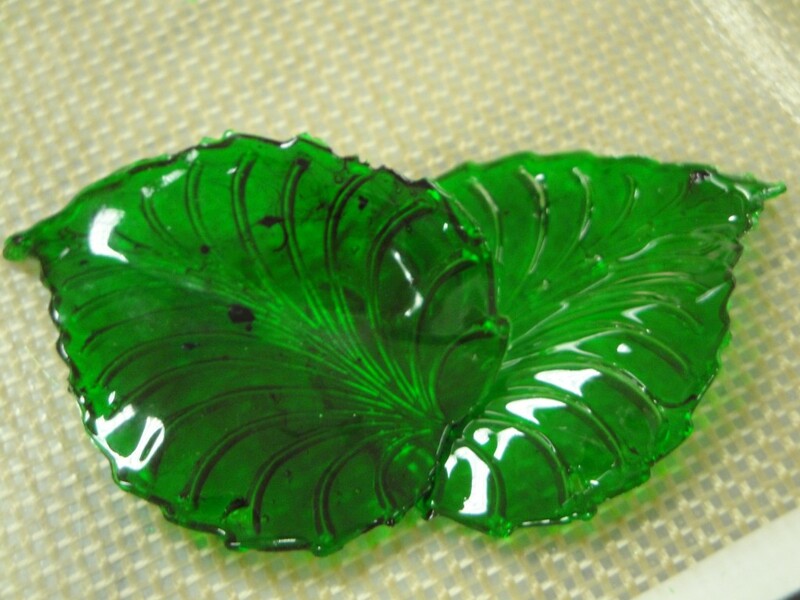 Pastillage, isomalt, or marzipan could be used for additional, finer details. The whole process seemed like it would be quite overwhelming, but as soon as we finished talking about our options, we got right to work. There was a mold that everyone needed to use which would give us the basic structure for our piece. We could place a variety of textured mats under the mold to achieve texture on the pieces, but other than that, the structure would be the same for everyone. While initially I was unhappy about this inherit structure, by the end of class I realized I would not have had a clue how to begin without it. After casting our main structural elements the first day, we came in on day 2 ready to work on our isomalt and pastillage pieces. I was immediately drawn to making “bubble sugar”. To make bubble sugar you crinkle up a piece of parchment paper and lay it down on a sheet tray. Then pour hot sugar over it and let it sit until cool and hardened. Because of the crinkles in the parchment, the sugar will wind up with bubbles in it and look like running water. Although I wasn’t sure if I was going to use it in my final piece, I knew that I wanted to at least get practice making it. I also cast some sugar jewels and leaves thinking that they may be useful for the flowers I knew I wanted to create. On day 3, my partner and I came in knowing we had a lot of work to do. We had decided to create 3 large flowers for the showpiece and knew we had a lot of work to get the petals done. 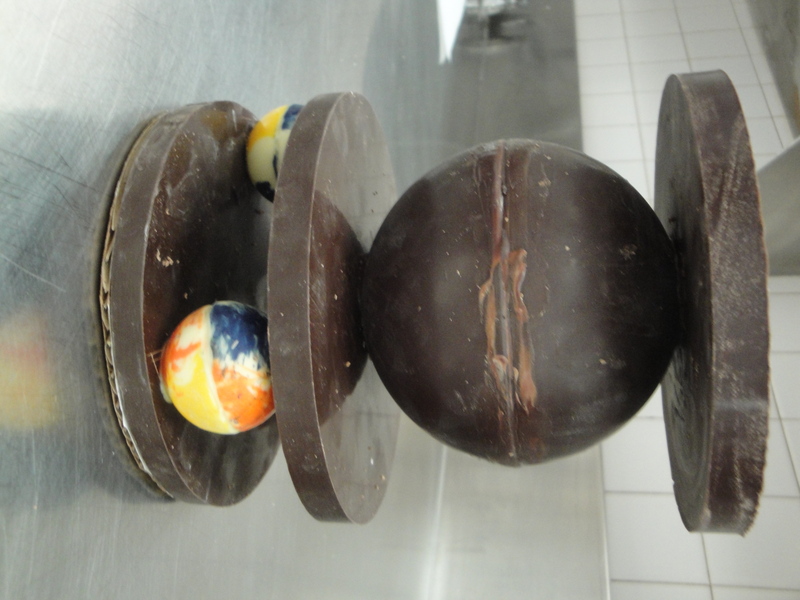 We also wanted to create 3 orbs that would sit underneath the showpiece and needed to cast those. We started with the orbs since they would take the longest time to set. 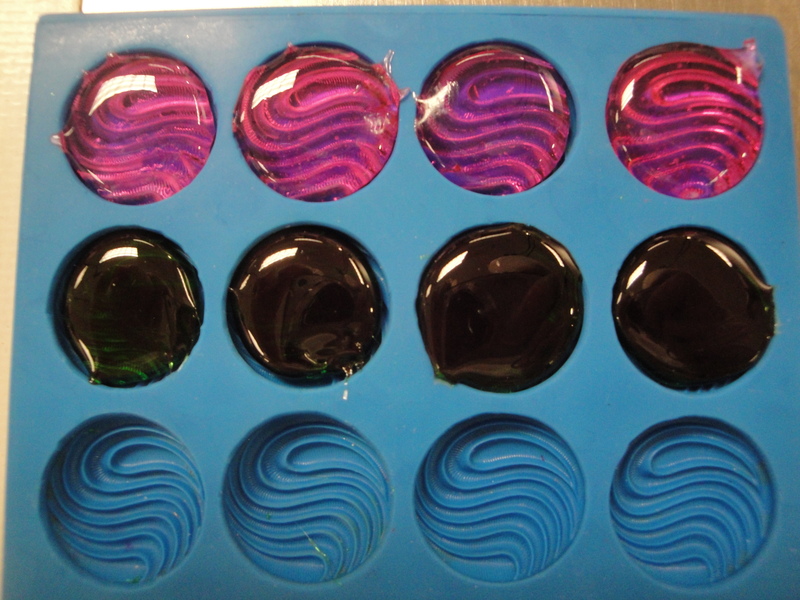 We brushed the inside of circular molds with some cocoa butter and then poured in tempered white chocolate. After they had set, we unmolded them and warmed the flat sides to get them to adhere to each other to create a perfect sphere. Then we moved onto the petals, which were so deceivingly difficult to make. 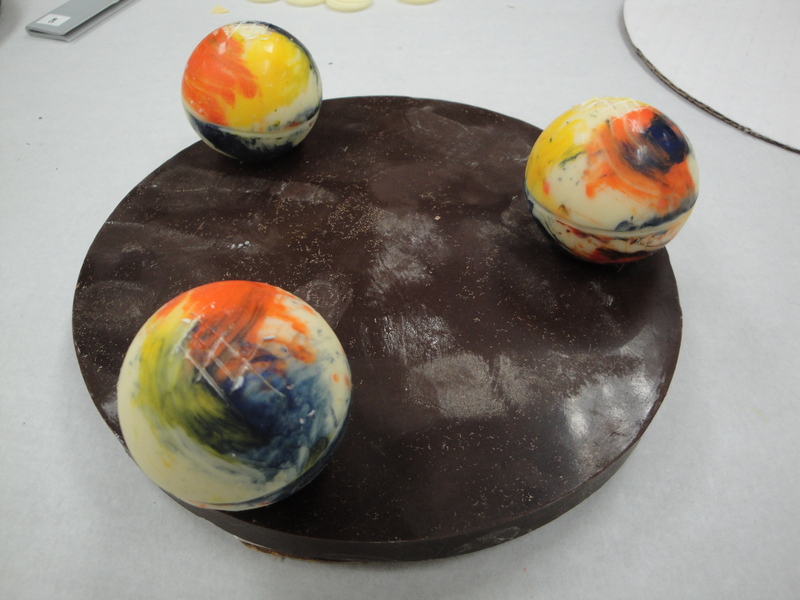 To make the petals, we needed to rub cocoa butter on a piece of acetate and cover it with tempered white chocolate. Then, when it had set enough to cut, but not enough to crack, we needed to cut out petal shapes, cover with another piece of acetate and place into a baguette mold, so we could get a curve. This process was impossible! We could not figure out the perfect time to cut the petals and it took us a while to figure out which side of the petal should have the color on it. But after about 3 hours, we finally got it down. 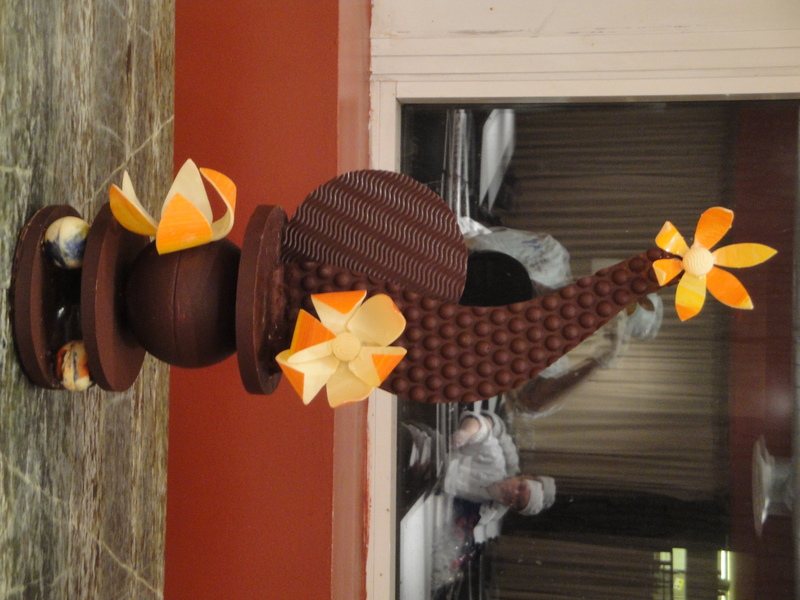 On day 4, we needed to assemble the final showpiece. We started with a disc, followed by our 3 spheres. Then we placed another disc and topped that with our larger sphere. It was important to make sure that every step of the way our showpiece was level or it could have catastrophic effects down the line. After leveling our sphere we added another disc and placed our S-curve in a channel above it. 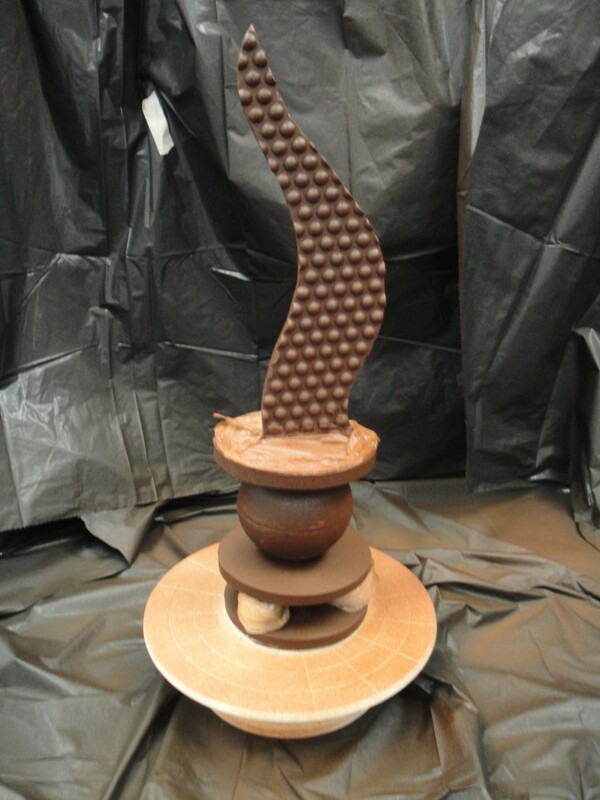 Then we sprayed the whole showpiece with some melted chocolate to give it a finished look. Then we finished it off with our additional decorative disc and our two flowers. 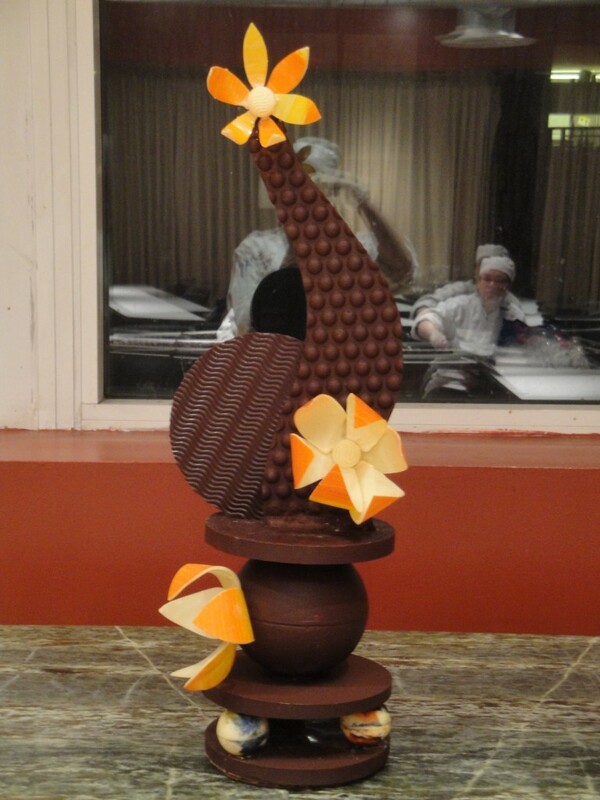 This entry was posted in chocolate, Institute of Culinary Education (ICE), pastry school and tagged chocolate, Institute of Culinary Education (ICE), pastry school by Maia. Bookmark the permalink.